The New York Titans were renamed the New York Jets for 1963. The New York Jets left The Polo Grounds following the 1963 season, for the new Shea Stadium as their home field in 1964. Go to New York Jets at Shea Stadium! 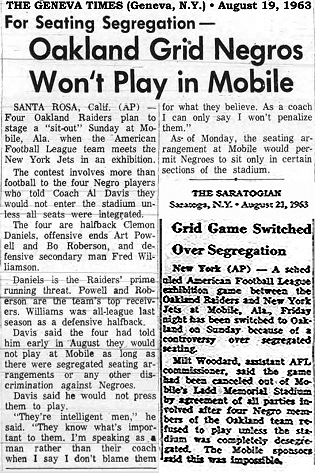 1 - The August 23, 1963 exhibition game at Mobile, Alabama, was canceled and moved to Oakland and played 8/25, due to segregated seating (a separate Negroes only section) at Ladd Memorial Stadium. Four black Raiders, Art Powell, Fred Williamson, Clemon Daniels & Bo Roberson publicly stated they would boycott the game unless the stadium integrated their ticket sales. The governor of Alabama and the stadium personnel would not relent. At first, the game was still being played, but eventually the Raiders (and owner Al Davis) and the AFL decided to move the game to Oakland. The Raiders had to pay thousands of dollars in guaranteed fees and penalties, as well as the Jets travel expenses to and from Oakland. See various clippings below. 2 - Due to the John F. Kennedy assassination on November 23, 1963, all A.F.L. games scheduled for 11/24 were postponed. The 11/24 Jets-Chiefs game was moved to Dec. 1, the 12/1 Jets-Bills game to 12/14, & the 12/14 Jets at Kansas City game to 12/22. 3 - The December 14, 1963 Jets loss to the Buffalo Bills, was the last sporting event held at the Polo Grounds (#4) (1912-1963), before its demolition. The New York Jets played at the new Shea Stadium, in Flushing, Queens, beginning in 1964. •The New York Football Giants (N.F.L.) played home games at the Polo Grounds, 1925-1955.